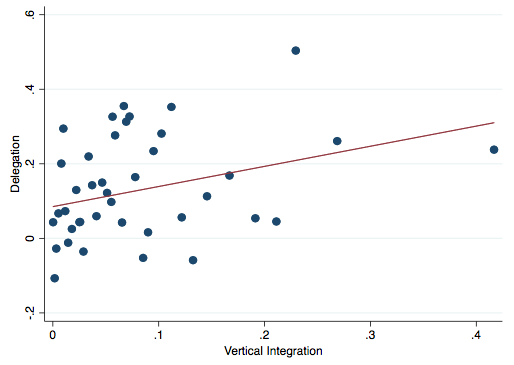 Economists have largely ignored the deep interdependency between integration and delegation. This column describes a new theory of integration and delegation choices aimed at shedding light on how these distinct elements of organisational design interact. Contrary to what is suggested by a naïve one-dimensional approach, the model predicts that delegation and outsourcing should be negatively correlated, a prediction that holds up well when the model is applied to data for thousands of firms across many industries and countries. One of the most basic questions any organisation faces is how much authority to delegate down the managerial hierarchy. This decision is influenced by the boundary of the firm – whether it integrates or outsources its production activities. To see this, think about the classic supplier-producer relationship between a car part maker (a supplier) and a car manufacturer (a final good producer). If the parties are vertically integrated in a single company, the headquarters (HQ) can either centralise key production decisions (e.g. how to tailor the input to the particular model of car produced) or delegate them to the supplier. If instead the HQ outsources the car part and trades at arm’s length, the supplier retains control over all production decisions unless these are fully stipulated in a contract (which they are generally not). To date, economists have largely ignored the deep interdependency between integration and delegation. Although some scholars have highlighted the conceptual difference (Aghion and Tirole, 1997; Baker et al. 1999; Hart and Holmström 2010; Legros and Newman, 2015), the economics of firm organisation is divided into twin theoretical silos looking at firm boundaries on the one hand and delegation on the other (Gibbons and Roberts 2013). A naïve approach based on ‘one-dimensional’ organisational models might expect delegation and outsourcing to go together because decentralising decision making within firm boundaries via delegation and decentralising decision making via outsourcing look like similar strategies. They both move decision making away from the centre of the organisation. What this approach misses, however, is the interrelation between integration and delegation. Aproducer can only decide whether to delegate or centralise decisions if suppliers are within the boundaries of her own firm. If there is some uncertainty about suppliers’ capability, integration affords a real option in terms of organisational design: a producer can choose to delegate to an integrated supplier if he turns out to be very able; if instead he turns out to be of low capability, the HQ can choose instead not to delegate. If the producer outsources production, the option to delegate or centralise is simply not on the table. The ability to adjust delegation choices within firm boundaries means that integration can be more flexible than outsourcing, in contrast to the classic view of Coase (1937). In a recent paper (Alfaro et al. 2018), we advance an emerging theory of interdependent integration and delegation choices and provide empirical evidence to study how these distinct elements of organisational design interact. Building on the framework of Legros and Newman (2013, 2015), we first develop a theoretical model that can offer sharp predictions about the relationship between the ownership structure of firms and their internal power structure. Integration and delegation choices are made by a downstream HQ, which uses inputs from multiple suppliers to produce a final good. Different HQs have different productivity levels – such as entrepreneurial abilities – and choose which inputs to integrate and which to outsource, and whether to delegate decisions to any of the integrated suppliers. An input (e.g. a car seat) is more valuable if it is adapted to the final product (e.g. the car seats should be tailored to different models of a Mercedes). Generic inputs rely only on the supplier’s direction to produce, while adapted ones require coordinated, non-contractible investments by both the HQ and the supplier (e.g. Mercedes and the car seat supplier must coordinate their production decisions for the seat to fit perfectly in a particular model). The supplier has low stakes in the enterprise’s profit, but bears the private costs of investments. If the transaction is outsourced, the HQ cannot see the investments through, so only the generic version of the input is feasible. In contrast, if the supplier is integrated, the HQ can exercise authority to elicit adaptation investments from the supplier. The benefits of integration are that (i) the HQ is able to procure an input that is adapted to her particular production needs as opposed to getting a generic component from an outsourced supplier; and (ii) there is an option value – she can delegate if the supplier turns out to be highly capable. In other words, integration provides some supply assurance, in that it guarantees at least a moderate level of input value. With outsourcing, low-capability suppliers deliver low-value generic inputs. The downside of integration is that adaptation incurs both fixed costs (by the integrated supplier) and coordination costs (by both the final good producer and the integrated supplier) to make the adapted component successfully. Given that the downstream firm will not take into account the costs of the supplier, integration may generate excessive costs and outsourcing may be preferred. Our model generates some novel predictions about the drivers of delegation and outsourcing and the relationship between them. First, contrary to what is suggested by the naïve one-dimensional approach, delegation and outsourcing should be negatively correlated. 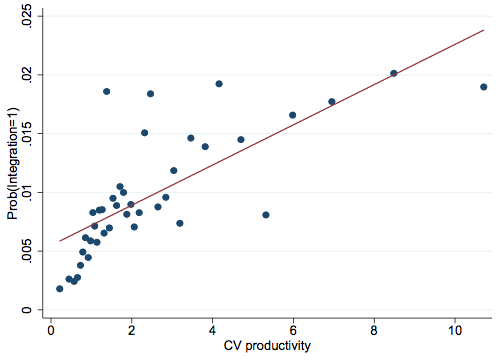 The logic for this result is simple – given that integration is on average more productive (but also more costly) than outsourcing, only the most valuable enterprises integrate, as they can spread the fixed costs over more units of production; enterprises that are more valuable also benefit more from better incentive alignment between the HQ and each supplier, and thus tend to delegate more to integrated suppliers. A similar logic is behind the second prediction of our model, namely, that suppliers of more important inputs should be less likely to be outsourced and, if integrated, they should be given more autonomy. Finally, the more uncertain the supplier’s capability, the higher the option value of integration, implying that producers should be more likely to integrate suppliers in input sectors with greater productivity variation. The theory seems to hold up well. On average, more vertically integrated firms delegate more decisions to their plant managers (see Figure 1). Suppliers of more important inputs (i.e. with larger IO coefficients) are more likely to be integrated. Among integrated suppliers, those with larger IO coefficients report more autonomy. Finally, uncertainty in the capability of suppliers in input industries are positively associated with the likelihood of integration (see Figure 2), in line with the idea that the option value of integration is higher for these input industries. These empirical findings are extremely robust – they continue to hold when we include different sets of controls and fixed effects, and use different samples of firms and countries. Organisations are complicated. Naturally, scholars trying to understand them have tended to consider one organisational facet at a time. As fruitful as that approach has been, it has some drawbacks. For example, by neglecting the interdependence between the boundaries of a firm and its internal power structure, previous studies have missed the flexibility of integration, which comes from the ability to delegate or centralise production decisions. Our study is a first step towards understanding how elements of organisational design that were previously considered separately may fit together in theory and practice. More theoretical and empirical work is needed to understand the interplay between various organisational choices (e.g. delegation and management practices) and the implications of these choices for firm performance. Acemoglu, D, S Johnson, and T Mitton (2009), “Determinants of Vertical Integration: Financial Development and Contracting Costs,” Journal of Finance 63: 1251-1290. Aghion, P, and J Tirole (1997), “Real and Formal Authority in Organizations,” Journal of Political Economy 105: 1127-1161. Alfaro, L, P Antràs, D Chor, and P Conconi (forthcoming), “Internalizing Global Value Chains: A Firm- Level Analysis,” Journal of Political Economy. Alfaro, L, N Bloom, P Conconi, H Fadinger, P Legros, A Newman, R Sadun, and J Van Reenen (2018), “Come Together: Firm Boundaries and Delegation,” CEPR Discussion Paper 12923. Alfaro, L, P Conconi, H Fadinger, A Newman (2016), “Do Prices Determine Vertical Integration?”, Review of Economic Studies 83: 1-35. Baker, G, R Gibbons and K Murphy (1999), “Informal Authority in Organizations,” Journal of Law Economics and Organization 15: 56-73. Bloom, N, R Sadun, and J.Van Reenen (2012), “The Organization of Firms Across Countries,” Quarterly Journal of Economics 127: 1663-1705. Coase, R H (1937), “The Nature of the Firm”, Economica 4: 386-405. Fan, J P H and L H Lang (2000), “The Measurement of Relatedness: An Application to Corporate Diversification”, Journal of Business 73: 629-660. Gibbons, R and J Roberts (2013), The Handbook of Organizational Economics, Princeton University Press. Hart, O D and B R Holmström (2010), “A Theory of Firm Scope,” Quarterly Journal of Economics 125: 483-513. Legros, P and A F Newman (2013), “A Price Theory of Vertical and Lateral Integration”, Quarterly Journal of Economics 128: 725-770. Legros, P and A F Newman (2015), “Integration, Delegation and Management in Industry Equilibrium,” mimeo. This methodology of has been used in many empirical studies on firm boundaries (e.g. Acemoglu et al. 2009, Alfaro et al. 2016; Alfaro et al. forthcoming). Thomas S. Murphy Associate Professor of Business Administration in the Strategy Unit at Harvard Business School.